Researchers Answer: Why Are Women More Religious? Home News Researchers Answer: Why Are Women More Religious? Women’s generally greater level of religiosity has been observed by scholars for decades; it has shown up in surveys going back as far as the 1930s. But not until the 1980s did academics begin a concerted effort to find an explanation for the phenomenon. 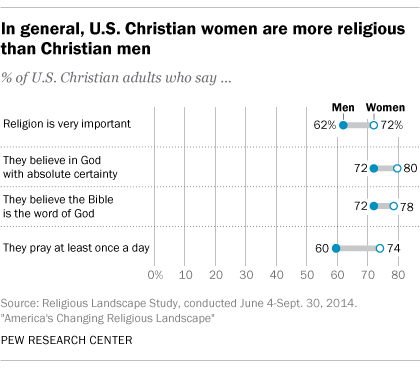 The most recent study on religiosity by gender came in the Pew Research Center’s 2014 U.S. Religious Landscape Study. It found more than 7 in 10 U.S. Christian women (72 percent) say religion is “very important” in their lives, compared with 62 percent of the country’s Christian men. Roughly 8 in 10 Christian women also say they are absolutely certain God exists and that the Bible is the word of God, compared with about 7 in 10 men who make the same claim. Roughly three-quarters (74 percent) of Christian women say they pray at least daily, compared with 6 in 10 men (60 percent). A similar dynamic is evident when it comes to church attendance. Christian women say they attend religious services at higher rates than Christian men. 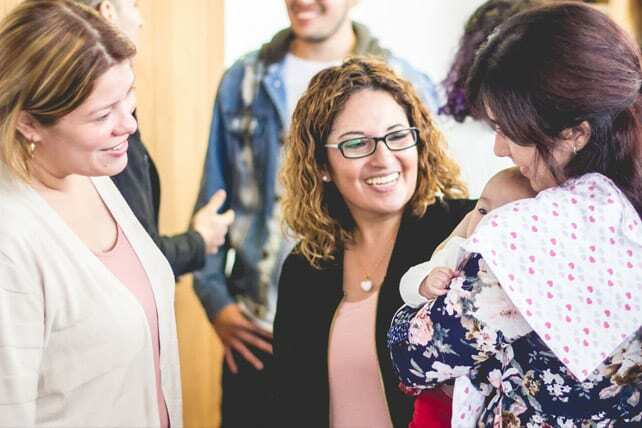 The theory was bolstered in a 2016 study that found between the mid 1980s through the late 1990s, the share of women working full-time increased while women’s worship attendance declined. Another theory that might explain religious service attendance trends points to the large gains in women’s educational attainment in recent decades. The idea that highly educated people are less religious, on average, than those with less education has been a part of the public discourse for decades. According to data from 2014, women age 25-34 were significantly more likely than their male counterparts to have completed a bachelor’s degree—38 percent versus 31 percent. Some researchers point to biology. Sociologists John P. Hoffman and Alan S. Miller noted that men appear to have a greater innate tendency to take risks, and therefore are more willing than women to gamble that they will not face punishment in the afterlife. As a result, men are less religious. Since women are generally more risk-averse, this theory posits, they turn to religion to avoid eternal punishment or to secure a place in heaven. Building on those findings, sociologist Rodney Star explained testosterone is the reason men are more willing to take risks. British sociologists Marta Trzebiatowska and Steve Bruce concluded in their book, Why are Women more Religious than Men? that the gender gap is not the result of biology but is rather the consequence of important social differences—responsibility for managing birth, child‐rearing and death, for example, and attitudes to the body, illness and health—overlapping and reinforcing each other. In the West, the gender gap is exaggerated because the social changes that undermined the plausibility of religion bore most heavily on men first. They also pointed out that women dominate the world of ‘New Age’ spirituality and are far more superstitious than men. Still other scholars said their research finds women may be more religious because they face more “existential insecurity”—a lack of economic stability and physical safety–prompting them to seek a sense of safety and well-being that comes from religion.